Well, I was hoping to have better news at this point concerning book two, but it’s something of a mixed bag. Early on in November I was sitting around 30%, and expected to be done with the first draft by the end of the year. As of today I’m around 55%. While progress has been steady these last few days, trying to solve a couple logistical issues with the overall series combined with the fact that book two has grown a bit in length (I’m guessing it’ll weigh in around 80k words now, compared to the 30k of book one), means that I’m looking at finishing closer to the end of January now. I don’t expect that to impact the release date for book two, but I may have to adjust my timetable for further books if they prove as lengthy as this one. The silver lining, I suppose, is that there will be a lot more content in the next book (titled “Curse of the Daemon Beast”). The book will focus a bit more on life in Korvana, as well as some of the specifics behind hexbullets and daemons. Plus lots of tension, high stakes battles, and magic bullets flying everywhere! I’m looking forward to seeing it when it’s all done. 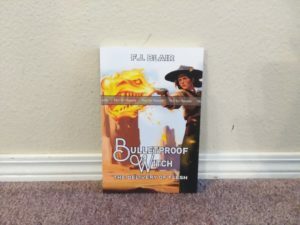 Author fjblairPosted on October 14, 2018 Leave a comment on First!